A non-commercial service in support of responsible home heating with wood - Fireplace Inserts: Installed right, they are effective & trouble-free. Back in the early 1980s when fireplace inserts were first installed, they had a bad reputation for being unsafe, inefficient and expensive to maintain. Most inserts were not connected directly to the fireplace chimney and, in fact, many older insert installations allowed the exhaust gases to exit the flue collar and find their way up the chimney. Later, a short length of stainless steel liner was installed up into the chimney of the original fireplace. This short length was called a 'direct connect', but there was not really a connection to the base of the fireplace chimney. Inserts installed this way were fussy to light, smoky to use and costly to maintain because the insert had to be removed to clean the chimney. An insert with a 'direct connect', made of a short length of stainless steel chimney liner. This type of installation was difficult and expensive to clean. Since 1991, the Canadian wood burning installation code has required that a stainless steel chimney liner be installed from the insert flue collar to the top of the chimney. (Direct connects are still permitted in the United States) The code permits alterations to the fireplace to let the installer create a clear route for liner as it passes through the throat and smoke chamber of the original fireplace. For this reason, a good insert installation should be considered permanent. Installed correctly, the insert should not need to be removed from the fireplace for many years because the liner and all the hardware supporting it is corrosion-resistant stainless steel. Where the liner passes through the fireplace throat (the damper, smoke shelf area), it should be sealed to the masonry, either stuffed with mineral wool (rockwool) or with a sheet metal plate. A good seal in this location prevents cold, smelly air around the liner from migrating into the room. An insert with a full chimney liner. Note that masonry material has been removed from the throat area and smoke shelf to allow the liner to curve gently before rising straight up through the chimney. This improvement in the design of insert installations has improved their performance to the extent that today's best fireplace inserts can be almost as efficient as free-standing wood stoves. If you already have an insert installed in a masonry fireplace, the addition of a stainless steel chimney liner can improve performance. In the twenty years since the Canadian code changed to mandate full liners for inserts and hearthmounts, they have become among the most trouble-free of all wood heating installations. This is because the liner runs almost straight up from the insert flue collar, which is the most desirable arrangement for reliable draft. Cleaning the flue is a simple matter of removing the cap and running a brush down to the insert. Any deposits are cleaned from the firebox by removing the baffle. The reliability of an insert installation depends on a perfect installation. If the liner connection at the insert flue collar is faulty causing the liner to fail, the results can be very messy. Knowing all the ins and outs and pitfalls of insert installations is a job for professionals. Don't make the mistake of thinking that installing an insert is a simple matter of running a liner up the chimney. Contract with the most experienced insert installer you can find. You won't regret the small additional cost. 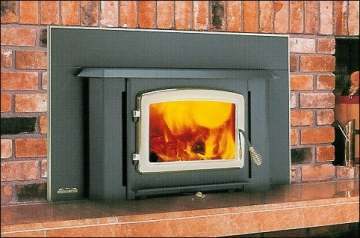 A hearthmount stove is an option to an insert for upgrading the performance of a masonry fireplace. 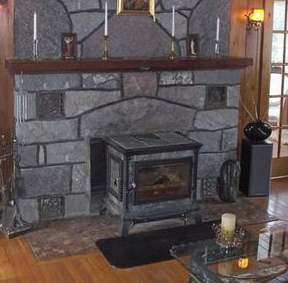 Hearthmounts are wood stoves mounted in front of or inside the fireplace and vented through the fireplace throat. They should also be vented through a full liner that is continuous to the top of the chimney. Only certain wood stoves can be used as hearthmounts. The certification label and installation instructions indicate if the unit can be vented through a fireplace. There are special inserts that can be installed in factory-built fireplaces. If you want to improve the performance of your conventional factory-built fireplace, ask your stove dealer if the insert you are considering is certified for this use. Here is a stove vented through the throat of an existing fireplace. A hearthmount should also have a full liner to the top of the chimney. In large fireplaces, the stove can be located right inside the firebox, directly below the chimney.